The government shutdown is now 27 days old and shows no sign of letting up. According to Oxford Economics, the shutdown will hurt GDP growth by 0.2% if it continues until the end of the month and 0.6% if it lasts the whole quarter. The longer the shutdown lasts, the larger the multiplier, so the impact could be larger than 0.6%. The scary aspect for government workers is if the shutdown lasts until January 25th, workers will miss their second paycheck. This should be a cautionary reminder for everyone to have at the very minimum a few months of expenses saved in case of an emergency. Because of the government shutdown, the business inventories and retail sales reports didn’t get released. The retail sales report was from December which is very important because it includes holiday sales. Some retailers have said sales growth dwindled at the end of the holiday shopping season. We will need to wait until the shutdown ends to see how accurate that is. We are now left with alternative data from private companies. The Redbook same store sales report signaled retail sales growth was strong in December. However, in the latest report for the week of January 12th, growth slowed sharply from 8.9% to 6.7%. This is still decent growth, but it’s not ideal in rate of change terms. It is the weakest report since November 24th. Month to date sales versus the last month were down 1.7% which is the weakest reading since February 2018. The chart below shows another estimate of retail sales growth by a private company. As you can see, the Bank of America internal data is plotted against retail sales ex autos. The two lines seem to move in tune with each other. This data suggests retail sales growth is slowing. Keep in mind, this data is volatile even though it is the 3 month moving average. 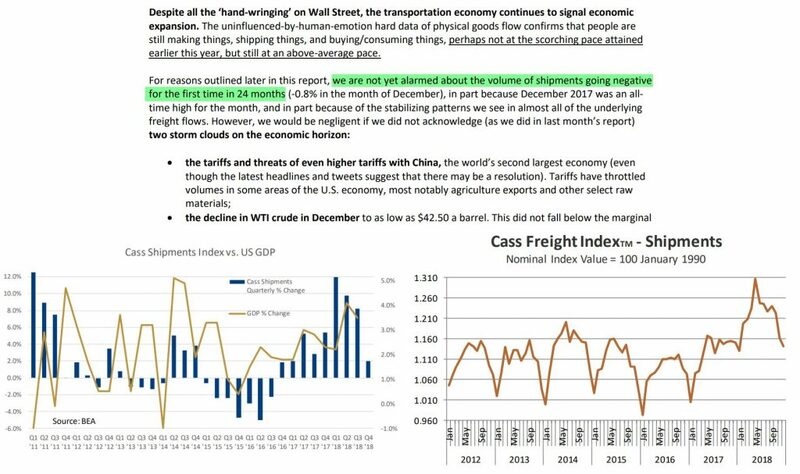 Given the tough comparisons we mentioned in a previous article, it’s no surprise that the Cass Freight index’s growth slowed in December. December 2017 was a record high for the index. The index actually declined 0.8% year over year which was the sharpest decline in 24 months. As you can see from chart on the left, this monthly report led to quarterly growth of about 2%. This implies GDP growth will be lower in Q4. The latest Atlanta Fed Nowcast shows GDP growth will be 2.8%. The chart on the right shows the index has only fallen to the high end of the range it was in from 2012 to 2017. The economy certainly isn’t in a perilous situation yet; this is just a slowdown. The commentary above states the index was hurt by the trade war with China and the decline in WTI oil. The index should rebound after the trade war is resolved. However, that probably won’t happen in January. The year over year growth rate will only get worse because the January growth reading was the highest of this mini-cycle. The Fed’s Beige Book showed the Fed finally sees economic growth slowing. It didn’t see the slowdown back in October which is partially why the S&P 500 fell 14% in Q4. The Fed’s analysis of the economy isn’t on the cutting edge. We follow Fed statements to understand monetary policy. When the Fed sees economic strength, it implies hawkish policy is coming. The current slowdown means dovish policy is coming which is good for stocks and bad for the dollar. Unsubscribe Anytime. No Spam. No Ads. No Fees. Please Review Privacy and Disclaimer First. 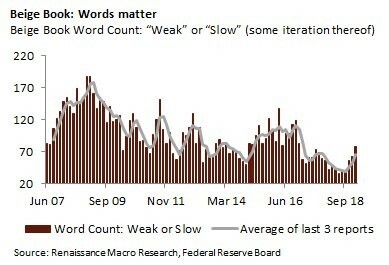 As you can see from the chart below, the Fed has started using the words “weak” or “slow” more often. The usage is still relatively low which means the Fed needs to catch up to be in tune with the economy. The next Fed meeting in January is interesting because of how much less drama there is than there was for the last meeting. Prior to the December meeting investors were wondering if there would be a rate hike given the stock market volatility and slowdown. Investors were also worried about the guidance for 2019. Now we know the Fed won’t hike in January as there is a 0% chance of a hike according to the Fed funds futures market. There shouldn’t be much of a change to guidance because the Fed has all year to take the 2 hikes it guided for in 2019 off the table. There is currently only a 13.9% chance the Fed will hike at all this year. The slight decline in core CPI in December will allow the Fed to be dovish on January 30th. 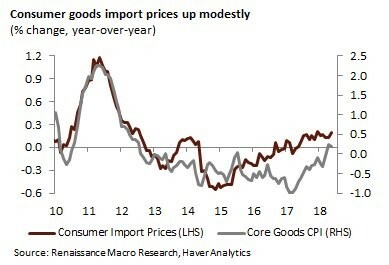 According to Renaissance Macro Research, the recent decline in the dollar index and the modest increase in consumer import prices led by non-auto consumer goods will cause core CPI to increase slightly. The estimated 0.2% increase in consumer goods import prices implies a boost in core goods CPI. If the core CPI reading were to increase sharply, it would put the Fed in a more nuanced position of suggesting a hike. However, the more likely slight increase probably won’t change anything. As we mentioned, a slight increase in core goods CPI isn’t enough to get the Fed to hike rates again. However, if the dollar starts to plummet, the situation could change. 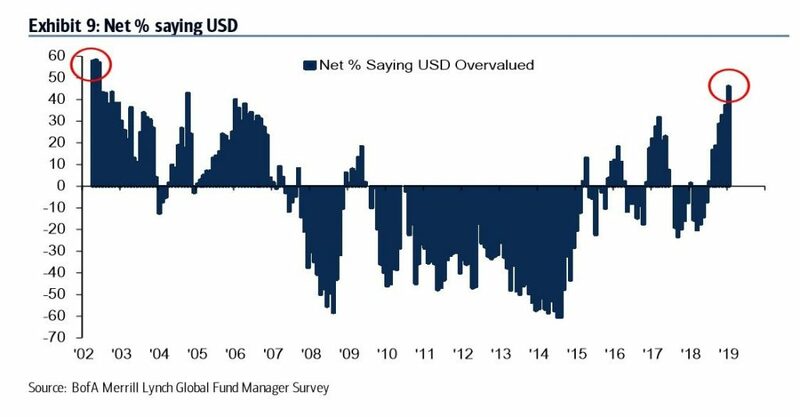 As you can see from the chart below, Merrill Lynch surveyed fund managers believe the dollar is overvalued. This is the highest percentage that believe the dollar is overvalued since 2002. From 2002 to 2008, the dollar index fell from about $113 to about $84. It’s not just this one major movement that was correctly called. If you pair a chart of the dollar with this survey, you can see, it has predicted the major moves in the dollar correctly. The stock market is rallying blissfully as we are unaware of how strong the economy is doing because many of the government reports haven’t been released. Based on the recent Redbook and Bank of America data, it appears the consumer may have slowed down recently. Growth in the Cass Freight index is also plummeting. The Fed is recognizing this slowdown. Core inflation should be modest enough to allow the Fed to keep rates where they are. The dovish Fed is one of the reasons many fund managers believe the dollar is overvalued. It was rated as the most overcrowded trade in January again.